Professional roofing contractors in Bolton, Bury & Manchester for roof construction. For flat roof repairs or flat roof conversion in Bolton contact Wothington Roofing today. If you have a leaking roof, broken tiles, storm damage or need gutter repairs call today. Worthing Roofing have over six generations of experience in the roofing trade in the local area. From loft conversion to installation of a roof window Worthington Roofing are your No 1 choice. 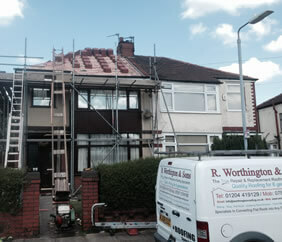 R Worthington & Sons are roofing contractors in Bolton Lancashire. With over six generations of experience in the roofing trade and fully insured for your protection Worthington Roofing provide expert roofing services for both domestic and commercial customers in the Northwest of England. As local roofers in Bolton our roofing services include converting flat roof to pitch roofs, roof tiling, roof repairs, dormer window installation, roof slating, roof window fitting, roofing inspections, lead flashing, repointing and leadwork. We undertake all types of domestic and commercial roofing contracts from roofing repair to roof replacement. R Worthington & Sons are a true family run business with highly experienced roofers covering all areas of domestic and commercial roof repair or replacement. Flat roofing specialists, expert at repairing or converting flat roofs to pitch roofs. All our work is fully guaranteed and covered by over £2 million of public liability insurance. Why Choose R Worthington & Sons for Roofing in Bolton? Expert Roofing Services in Bolton - How Can We Help Today? All types of roof construction. Experts in roof window fitting. Bolton's No 1 slate roof specialist. Lead flashing and brick pointing work. Looking For An Affordable Local Roofer in Bolton Lancashire?